I inputted these lines to a TI-BASIC file in SourceCoder but it never passes the check. I made sure that there are no tabs in the code by putting it in Sublime Text and checking implicit spaces. And for whatever reason Cemetech doesn't display my text right and omits lots of spaces in between. Did you copy and paste this from something? It seems to think the "N" is an invalid character, perhaps something that looks like "N" but isn't. Please try to type a regular "N" over those. 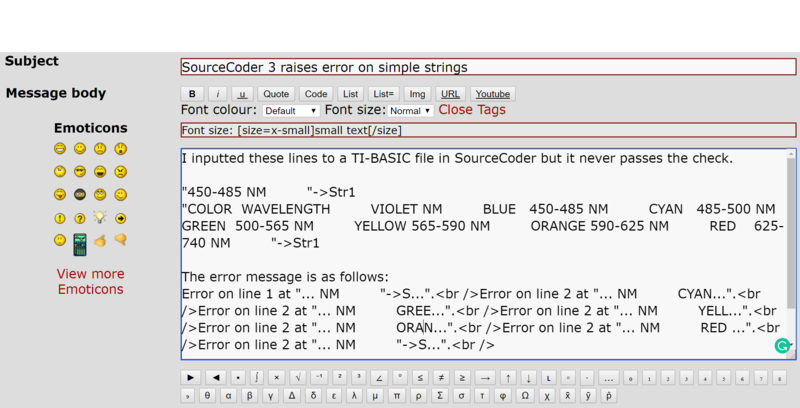 But if the string works when I paste it from the posted message and try it again in SourceCoder. I have no idea why this happens. I can't replicate, it works fine for me. Can you click on "Share" and PM the link to me? Maybe I can find the issue or something. @PT_ Thank you so much. I will never think about that. Do you know any way to visualize those weird characters? Is there a good way to detect and handle unsupported characters before compilation? The real question is, how did you get No Break spaces in the first place, in your programming? It *would* be nice to give SourceCoder a way to highlight where in the program errors were found. P_T and I will confer about that. 1. it's easier to replace all unsupported characters like em dash, etc. There are 235 users online: 6 members and 229 guests. Members: GregsAStar, Jeffitus, jschoe8049, _iPhoenix_. © Copyright 2000-2019 Cemetech & Christopher Mitchell :: Page Execution Time: 0.103391 seconds.